Flight from fear is a collaborative line of ceramic dishwater with illustrations by Harrison Bucy and fabricated by Joan Wyand. Click here to visit our online store! This 12 ounce slip cast ceramic cup is light, durable, and stylish! It is microwavable and dishwasher safe. 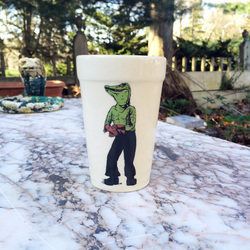 The decal image is drawn by Harrison, and Joan makes the cup. It makes a great gift, and is great to use at home or on the go. Enjoy this new color design! This cup is approximately 5x 3.5 inches.